No amount of moleskin can prepare you for what will happen if you don’t break in your tactical boots before you ruck or train in them. So, here's a rundown of two of our favorite ways: the wet and dry methods for breaking in boots. Breaking in tactical boots using the wet method is a lot faster than wearing them to break them in, but it doesn’t work with boots that require a high-gloss shine. It only works on boots with leather uppers because leather shrinks and forms when it’s wet. Put your boots in a bathtub or wash tub. Fill them with water until they’re completely soaked. If you see dry spots, soak them longer. Empty the water from your boots. Wear your boots for a full day. Remove the insoles and lay them out separately to dry. Put your boots outside or in front of a fan to fully dry. Summer tactical boots usually have vents on the sides, so they tend to dry faster than winter boots do. If you live in a humid environment, your boots may need to dry for a few days. For the best fit, you may have to repeat this process a few times, but generally, once or twice is sufficient. Safety Tip: You’re not likely to get trench foot from wearing wet boots for one day, but it’s still a good idea to take off wet boots every couple of hours and let your feet dry thoroughly. Put on two pairs of dry socks before putting the boots back on to help protect your feet. The method to use for boots that can’t get wet – such as dress boots or boots with a high-gloss shine – is to wear them as often as possible. This method works well for military boots, police boots and everyday work boots. The idea behind it is to put as many miles as you can on the boots before you have to wear them on a daily basis. Start slowly. The first time you wear your boots, put them on for no more than an hour. Increase the time each day until they're comfortable enough to wear all day. Wear nylon socks underneath your thicker socks to help prevent blisters. Apply moleskin to areas that are prone to rubbing or blistering. Walk, run or train as much as possible after the initial break-in period to expedite the process. Breaking in your tactical boots helps ensure that you’re as comfortable as possible while you’re at work, on the range or conducting PT. A personalized fit also minimizes the chance that you’ll get blisters on that 15-mile ruck your commander has been talking about. 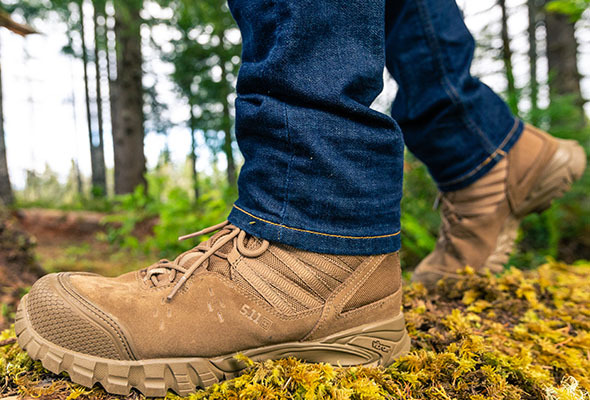 Find the best new tactical shoes for men and women at 5.11 and start breaking yours in today.